You don't have to be a furniture connoisseur to know quality. You can see it. Don't be fooled. Compare and see the Carolina Chair difference! 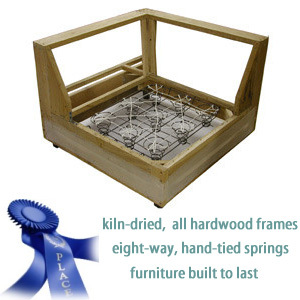 5/4" solid kiln-dried hardwood frames from sustainably managed forests ... guaranteed to last. All our frames are double dowelled, glued, and screwed. Hardwood corner blocks are used at critical joints and stress points. 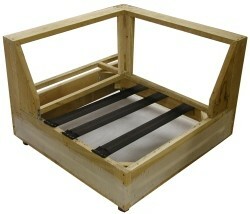 Eight-way hand tied steel coil springs ... weight is distributed evenly for years of comfortable seating. Every seat cushion is made with an Ultra Cell High-Resilency foam core with an Ultra Cell soft wrap on top and bottom for added comfort. With our Dupont DuraLife fiberfill back and throw pillows, you will receive comfort for a lifetime. Or upgrade to fiber down or all down cushions. Your furniture is hand cut, sewn and upholstered by our skilled craftsmen. Choose from our great selection of fabrics. Free shipping and in-home white glove delivery. Cheap substitutes include tempered steel continuous wire spring system, eight guage (or heavy guage) sinuous springs, "no sag" or serpentine springs - a lower quality seating system. 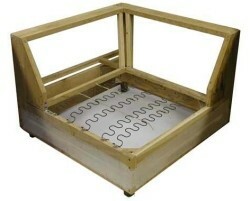 While sinuous springs are less expensive to produce, they do not provide a comfortable long lasting piece of furniture. Despite claims to the contrary, use of these substitutes will cause unsightly sagging over a short period of time. Webbed seating - mostly used by the national chain, low cost furniture stores. This is the lowest quality seating in the industry. Very inexpensive to produce. Sagging guaranteed. Learn more about quality furniture construction from HGTV's Anatomy of a Chair by Mark McCauley, ASID then return to this page. You will learn why your next furniture purchase should come from Carolina Chair! Furniture is a major purchase. If you don't know how a sofa is constructed, ASK! Go Green! Furniture is an invesment and should not be disposable. Carolina Chair furniture is made to last!